Another day, another new entry-to-mid-range Radeon board. 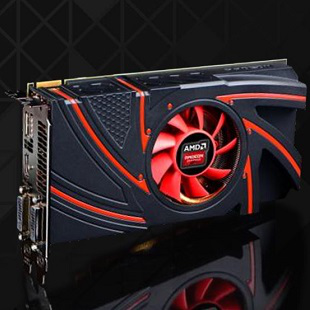 Thought the R7 250X announcement was enough AMD GPU news for one week? Think again. Later this February, AMD will start selling a new $149 GPU -- the Radeon R7 265. The R7 265 slots in between the R7 260X and R7 270X. Interested parties will find GCN (Graphics Core Next) tech paired with 2 GB of GDDR5 onboard, along with a 256-bit memory interface, 1,024 stream processors, and support for the usual AMD suspects: PowerTune CrossFire, Eyefinity, and Mantle. DirectX 11.2 will also be supported. Lastly, the R7 265 runs at about 150W, requires one 6-pin power connector, rounding out specs we'd expect to see in a $149 card. Performance and hands-on will have to wait for now, but AMD promises a 25 percent boost over the R7 260X, which will soon drop in price to $119. Expect more news on the R7 265 by the end of the month.